Dr. Tacy Dawkins came to River Oaks Animal Hospital in September of 2017. She graduated from Kansas State University for both undergraduate and veterinary degree coursework. She has practiced for over 5 years in both general practice and emergency medicine. Your pets are sure to love her bubbly personality and she is excited to build relationships with all of you. 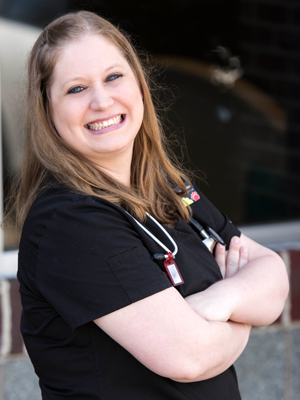 Dr. Tacy shares her home with a Bloodhound, two kitties, and two small children, Cannon and Ember, as well as her husband, Ryan. As you can see she is one busy lady. Dr. Tacy has been a wonderful addition to River Oaks Animal Hospital and a God send to Dr. Heather.